15 Aug 2017 | International News : U.K. The new-look Honda Jazz has been revealed ahead of the 2017 Frankfurt Motor Show. As well as updates to the exterior styling and interior trim, the new Jazz will also be available with a 128bhp 1.5-litre i-VTEC petrol engine for the first time in Europe. Honda's 128bhp petrol engine combines high output with low fuel consumption, and complies with stringent Euro 6 emissions standards. It achieves fuel economy of 22.2km/L and CO2 emissions from 124g/km with the optional CVT automatic transmission. The CVT system itself has been revised to deliver a more linear and refined response under acceleration. The 128bhp petrol engine is offered as part of a new Dynamic grade, which adds a thinner front splitter beneath the lower grille, and triple-strake diffuser to the rear bumper - both finished with a sporty red accent line. The Dynamic grade also includes LED head lights, front fog lamps, side sill skirts, a tailgate spoiler and gloss-black 185/55 R16 alloy wheels. The interior features a unique pinstripe pattern on the upholstery and a leather-wrapped steering wheel and gear knob, all of which are enhanced by orange stitching. The new Honda Jazz retains the exceptional versatility of the previous model, including boot space of 354 litres (up to 897 litres with the rear seats folded down) and passenger space that is unrivalled in its class. Standard equipment on the Jazz includes cruise control, automatic head lights and a City-Brake Active safety system. Higher grades feature a 7.0-inch Honda Connect infotainment system, rear-view parking camera, keyless entry and start, as well as advanced safety technologies such as Forward Collision Warning, Lane Departure Warning and Traffic Sign Recognition. A 101bhp 1.3 i-VTEC petrol engine will continue to be available across all Jazz trim levels, apart from the new Sport grade. 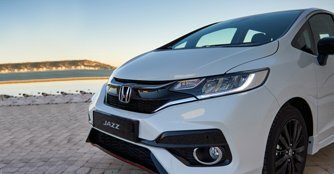 The new-look Honda Jazz will be available to order from November across Europe, with deliveries starting in early 2018.